Lucerne is one of the most beautiful and unique cities in the Confederation. Situated on both banks of the river Reus, on the west end of the homonymous lake Lucerne, the city has all the advantages that Confederation is popular worldwide for - around it, the sights consist of scenic mountains, lakes, alpine villages and meadows, in which graze undisturbed the famous Swiss cows. Lucerne is the most populous city in the central province of Swiss Lucerne. The city is located 54 km from the economic and financial center of the country, Zurich. 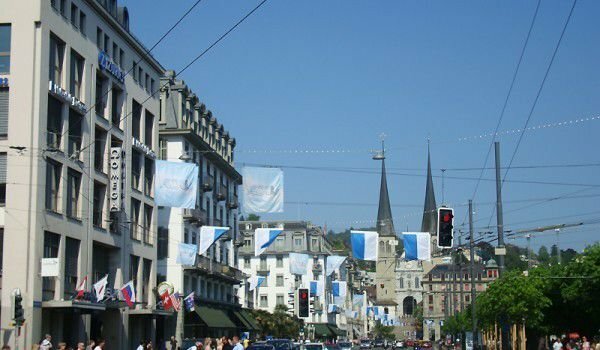 Today, in Lucerne live about 60 000 people, but locals know that from time immemorial these lands have played the role of an important trade junction between north and south. The settlement of this place was underway even in Roman times and during the Middle Ages. Lucerne was one of the most significant cities because of the unique covered bridges. Around 1400 Lucerne was the only city in Europe that can boast 4 such bridges. The city is often called the "city of light". This definition comes from an old legend that tells how an angel of light indicated to the first settlers where to build a chapel in honour of Saint Nicholas, protector of sailors and fishermen. Today the village is a popular tourist destination because of the beautiful Swiss scenery around, up from the top of Mount Pilatus and Rigi, there are many leisure opportunities on Lake Lucerne, especially because of its unique ancient architecture and well-preserved old town, the "City of Light." The small but well-preserved centre of Lucerne is a veritable maze of cobbled streets and squares. It is a pedestrian zone, composed of small and colourful houses in the medieval style, among which appear beautiful flowers. Along with the various homes, shops and hotels, you can see amazing frescoes. Above the centre of Old Lucerne are preserved parts of the original fortification wall, which is one of the many attractions of the village and offers fabulous views of the area from its height. Among the important historical monuments of Lucerne are the octagonal Water Tower, City Hall building, Hof Church and the Jesuit Church, which is one of the most beautiful baroque churches in the country. 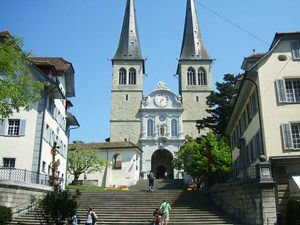 There is also the Franciscan Church, considered the most beautiful Gothic churches in central Switzerland. Do not miss the palace Rittersche, dating from the late Renaissance. Lucerne is emblematic with its covered bridges and medieval Chapel Bridge, which is rated as one of the most visited and popular tourist attractions in the world for 2010. This is the oldest and longest covered wooden bridge in Europe. It reaches a length of 204 m. It dates from 1365 and the Water Tower is located in the middle of the bridge. It was built earlier than Kapelbrücke, around 1300 and is 34 meters high. Over the years, it has served as both a prison and a treasury. The Bridge of Lucerne is covered with a tile roof, and underneath you can see major paintings from medieval times, to the 16th century. Another famous bridge in town is the covered wooden Schprörbrüke. Also known as the "Bridge of the Dance of the Dead", due to the 67 themed paintings by artist Caspar Meglinger. Gletchergarden, or the Garden of glaciers, is a unique natural phenomenon and a pride of Lucerne. Here you can see exhibits from the last ice age, fossils of shells and palm leaves, telling the history of the local land from 20 million years ago. Nature remains were discovered accidentally in 1872, during the construction of a cellar. Within this park, tourists simply must visit the museum of mirrors. Built back in 1899, it offers over 90 different mirrors.